City University London has become one of the first universities to implement the pioneering value testing for applicants to healthcare programmes. Starting in 2015 all applicants for City University London healthcare programmes will undertake a Cambridge Personal Styles Questionnaire (CSPQ) as part of the recruitment process. This is in order to assess if applicants have the right values to become successful healthcare professionals. Designed to report candidate potential against seven generic healthcare competencies, the test will be used in conjunction with other competency tests already in place, such as literacy and numeracy. Implemented in response to the Francis Report (February 2013), which examined the failings in care at Mid-Staffordshire NHS Foundation, the test meets one of the key recommendations from the report by aiming to improve support for compassionate caring and committed care. Kay Jones, Chief Operating Officer for City's School of Health Sciences, presented the work the University has done on developing value testing at the 'Vital Signs: Assessing applicants for medicine and healthcare' conference at the Royal College of Physicians. Speaking about the test, she said: "CPSQ can be used to assess candidate behaviours against NHS values and behaviours. The closer the match, the greater a candidate's potential fit with medical, nursing and healthcare careers. 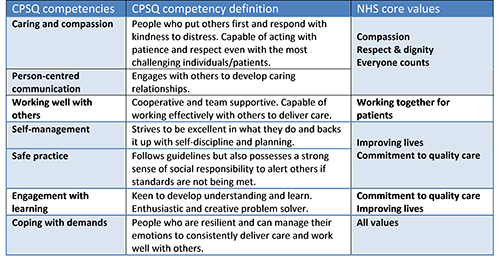 Good person-career fit is a great foundation for learning professional competencies, behaviours which further embed NHS values as personal standards. "This is a further example of how City University London is leading the way in the selection and training of excellent nurses and healthcare professionals." "We are delighted that City University London is taking this important step which will help to ensure that its students have the values and behaviours they need for a successful career in healthcare. Our personal styles questionnaire is designed to help to select students whose values and behaviours are in line with those of the NHS, and who have the personal qualities they need for success in these demanding roles."